Octopus OA in its present form is a company evolved from the humble beginning of a sole proprietor business known then as Octopus OA Supplies in May 1998. 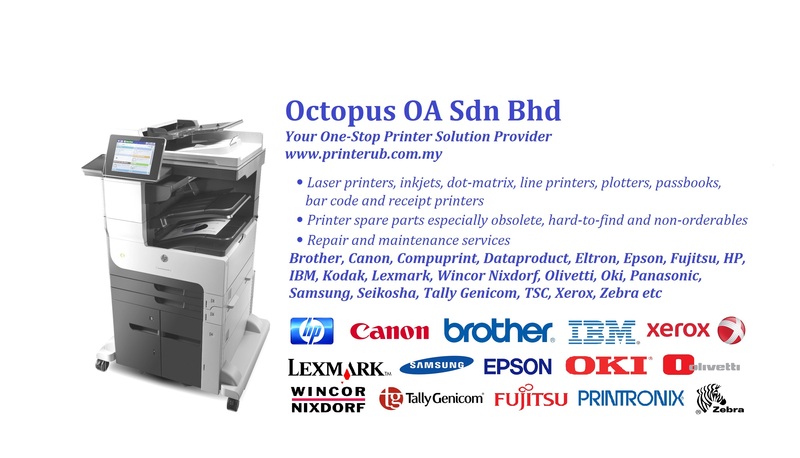 Whether you want to find a cartridge, new or obsolete printer, printer parts, resolve that paper jam in your printer, perform regular maintenance, improve the print quality or need simply to fix your printer, we are glad you are here because we are passionate about what we are doing and we will help you to get your printer fit again. 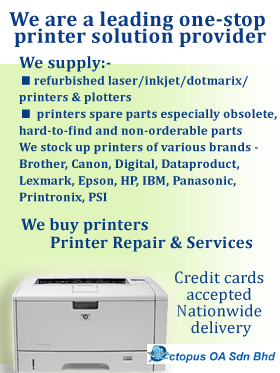 Compatible cartridges for laser printers, ink printers, dot-matrix, line printers, passbooks, bar-code printers. We believe in building relationships with our customers and business partners. With an extensive network of 1000 business partners nationwide; our achievement speaks for itself. We are simply very focused in what we do ! Sale of pc, printers, printer parts and consumables. We are known for supplying quality and offering wide range of after-market printers and IT products, even obsolete models and hard-to-find parts. Repairing, servicing and maintenance works for printers of all types ~ laser printers, inkjet, plotters, line printers, dotmatrix printers, passbooks, barcode & receipt printers, fax machines etc. Adf assemblies, main boards, fuser assembly, formatters, dc controllers, display panels, scanner assemblies, systems boards, power supplies, trays and covers, LCD backlight replacement, Ups, pick up rollers, pick up assemblies, printhead, separation pads.